We have tiered our spay/neuter pricing to ensure everyone can afford it. Chicago Residence. 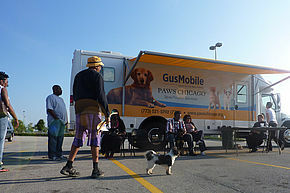 Our discounted services are currently focused on making Chicago a No Kill city. You must be a resident of the city of Chicago to qualify. Low-cost vaccines are also available on the same day of surgery. To qualify for free or reduced cost spay/neuter, please bring your state-issued medical card and matching picture ID. Prices effective January 1, 2017 and are subject to change. **Targeted Zip Codes: 60609, 60617, 60621, 60623, 60628, 60629, 60632, 60636. Permanent identification that will help lost pets get back to their owner. This purchase includes prepaid registration. This is a beef flavored tab that your dog will eat like a treat once a month, which contains heartworm preventative as well as a general dewormer. We recommend this product be given every month, all year long, for your pet’s entire life. It is sold by the weight of your dog in 6 or 12 month supplies. Guaranteed Flea and Tick elimination and prevention. Kills 100% of fleas within 18 hours of application and 100% of ticks within 48 hours. Each topical applicator works for an entire month. Sold by your pet’s weight in 3 or 6 month supplies. Prevents and eliminates fleas, prevents heartworm disease, treats and eliminates ear and sarcoptic mites, and eliminates American Dog Ticks. Each topical applicator works for an entire month. Sold by your pets weight in 3 or 6 month supplies. This data determines our Targeted ZIP Codes—the .areas most in need of spay/neuter to control pet overpopulation. Targeted ZIP Codes are currently 60609, 60617, 60621, 60623, 60628, 60629, 60632, 60636. ***Presurgical Bloodwork is mandatory for all animals 6 years of age or older to assess surgical risk. Bloodwork is not able to be performed on the GusMobile. The client must bring bloodwork report with them to the appointment or may elect to have bloodwork processed at the Lurie Clinic prior to surgery. 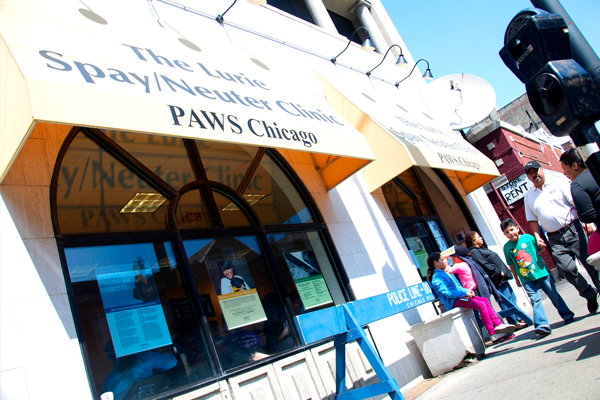 PAWS Chicago performs free and low-cost surgeries for Chicago under-resourced families.